Antique planing tools are part of Michael Walton’s woodworking arsenal. Inside an individual room box. It’s St. Patrick’s Day and lots of folks – especially here in Chicago – are celebrating the manifold contributions of the Irish. So let me chip in. Here’s someone new to add to that magnificent collection of Irish talent that has landed on our shores. Someone I met via serendipity. It started with a stoplight. I’m driving home from an interview a couple of weeks ago & pull up to the intersection of Laramie and Irving Park Road. Not much to look at -- just a couple of car dealerships and a gas station. I park, grab my gear, and head in the door, tape rolling. Two dogs yip at my feet and a man with a pleasant Irish brogue asks if I mind the dogs? Not at all. I’ve just met Fin McCool, a poodle/schnauzer mix named after a benevolent giant with magical powers, according to Irish folklore. The other dog I meet is a Brindle Boxer called Bronagh, an old Irish girl’s name. All that is prelude to meeting the proprietor. It turns out I’ve just barged, unannounced and uninvited, into the workshop of traditional furniture maker and master craftsman Michael Walton. When he landed here ten years ago from Dublin, his green card classified him as an alien with extraordinary ability. At the outset of his career, he tells me, he worked for years as an apprentice at one of the top antique dealers in Ireland. I don’t doubt it. 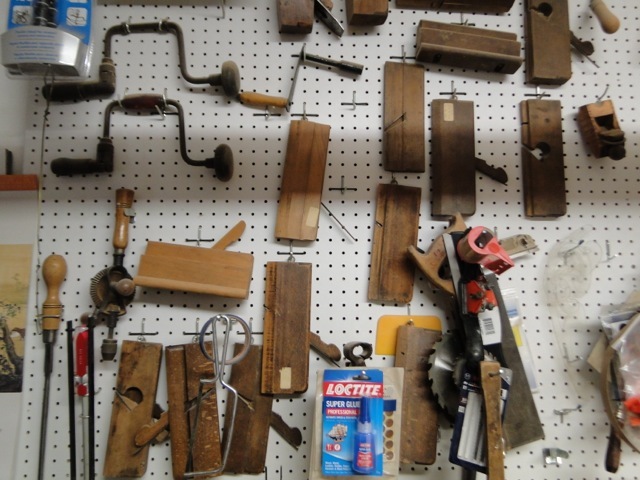 A wall of his workshop is lined with tools including antique planes from the 18th and 19th century. The kind of array I drool over at flea markets. He has flat planes for flat surfaces, convex planes for working on inside curves, like in barrel making – all different tools for the various areas of the wood trade. Furniture-making and antique restoration are not the whole of Walton’s business, however. The most astounding aspect of his work is a related, self-taught skill. 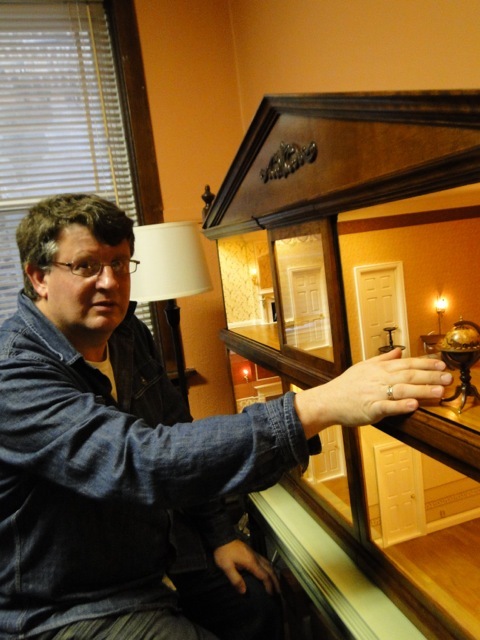 For the last twenty years he has specialized in hand-built miniature furniture. Collectible, fine museum quality furniture. The kind of thing you see at the Thorne Rooms at the Art Institute. Walton offers to show me some pieces, and with that he walks me to an area just behind the storefront. It turns out Walton’s commute to work takes, umm, let me see. About four seconds. Just across from the couch, and within eyesight from his bed, sits Walton’s latest project. It’s six room boxes, made to look like a dollhouse with the front wall removed. It allows voyeurs (like me) to enjoy all the splendor inside. I see a chandelier, a fireplace and mantle, an antique table, chair and lamps-- and one piece in particular he has built, that is jaw-dropping. It’s beyond me how Walton can create this extraordinary miniature work-- and then part with it. “Don’t you fall in love with the pieces you do?” I ask him. “Yeah, yeah, I do. But you always have to move on to the next project,” he tells me. “Every job is a project with a new beginning. And new problems,” he laughs. Walton’s work is on display at his website. 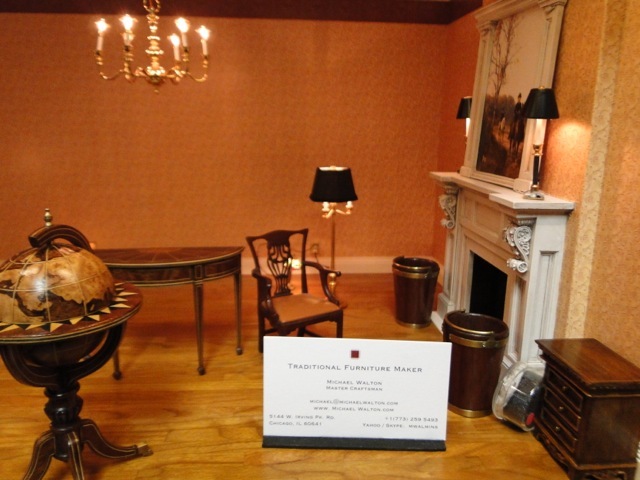 Or you can see it at a miniature dollhouse event in Chicago coming up on the weekend before Easter. Walton will teach two wood-finishing classes prior to that event.